Messerschmitt Bf 109 F-4 6./JG1 (Yellow 1+) Werk Nr. 8603 flown by Uffz Herbert Purz who was later shot down over the North Sea 15 km W of Walcheren on the 8th May 1942. Uffz Herbert Purz was KIA his body washed ashore on 9 June at the beach near Ostend - Bredene on. Photo 01: Obgf. Schmaul, a member of 12./JG1's ground staff, sitting on the wing of a Bf 109F parked in a blast pen at Monchen-Gladbach during the Summer of 1942. 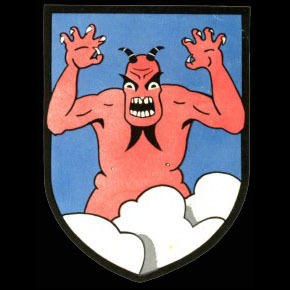 The 'Devil in the Clouds' emblem of IV Gruppe, first introduced during 1942, is visible on the nose, while beneath the cockpit is the earlier Maltese Cross emblem, originally of III./JG1 but later taken over as the Geschwader emblem. Remarks:KIA 4 July, 1942 by return fire from a Boston of RAF No. 226 Sq. who was raiding the Katwijk and Bergen airfields. He crashed at the Katwijk airfield as he was attempting to takeoff. He was the 1st loss of 10/JG-1. Buried Ysselsteyn, CL/1, Gr 25.